The DeLuxe Traffic Mirror and Pro Series Traffic Mirror range includes a 3" clamp bracket for pole mounting. 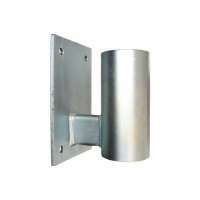 The Wall Mounting Adaptor is used for mounting these mirrors to a wall or flat surface. This adaptor is made from solid steel and zinc coated for long term durability. Not compatible with Indoor Outdoor models and Heavy Duty models, which already include a wall mounting J-Bracket.